When the cartilage covering the weight-bearing areas of the hip joint is lost in osteoarthritis, the resultant rubbing of bone on bone produces pain, stiffness and limp. 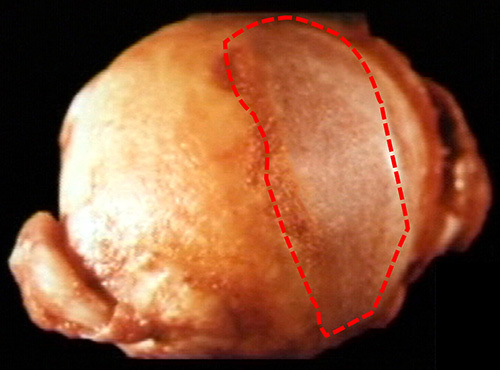 Fig 1 shows this cartilage loss in a fairly small area of the head of the femur. 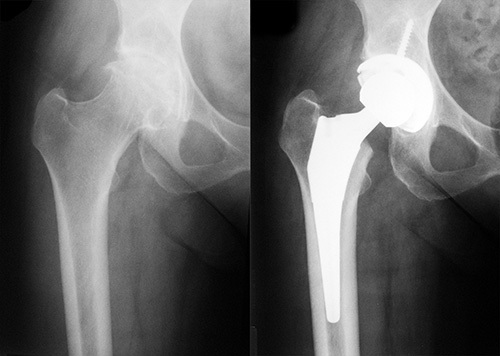 It begs the question why Total Hip Replacement (THR), the accepted treatment for this condition, is so radical, as it involves removal of the femoral head and neck, insertion of a metal stem down the upper femur and insertion of a prosthetic cup into the socket as shown in Fig 2. 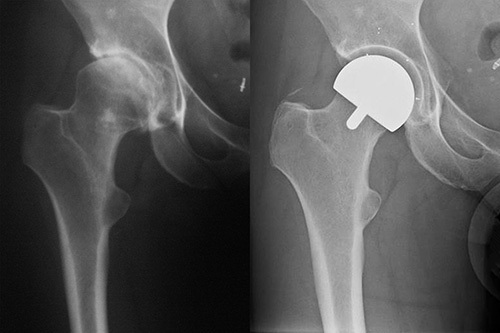 Professor Sir John Charnley attempted treatment of the arthritic hip in the 1950's with hip resurfacing, where only the cartilage of the femoral head and socket were replaced with thin layers of PolyTetraFluoroEthylene (PTFE). These implants unfortunately failed within months, Charnley's thinking was that the culprit was death of the femoral head as a result of interrupting its blood supply. He therefore moved on to a THR using PTFE cups paired with metal stemmed femoral components. Initially these were successful, and he carried out some 300 procedures. The initial success was not maintained, and at 2 years the implants started to fail with osteolysis (bone loss associated with the debris caused by wear). Most of these patients needed further revision surgery, very distressing for them and their surgeon alike. While Charnley was away on a six week skiing holiday, his technician, Harry Craven, had started testing polyethylene in the laboratory and shown its wear to be greatly superior to that of PTFE. Having checked that polyethylene was inert by having a sample implanted into himself, from 1962 Charnley put the new implant into patients. It was massively successful and over the years went on to provide relief to hundreds of thousands of patients with hip arthritis. In the long term wear related failure occurred more frequently in young active patients. Surgeons maintained that patients should not abuse their implant and sporting activity was very definitely frowned upon following a THR, the common advice being 'if you feel like doing exercise, have a lie down until the feeling passes'. The conventional polyethylene cup has been replaced in recent years with cross-linked polyethylene and this has dramatically reduced wear and wear related failures in THR. 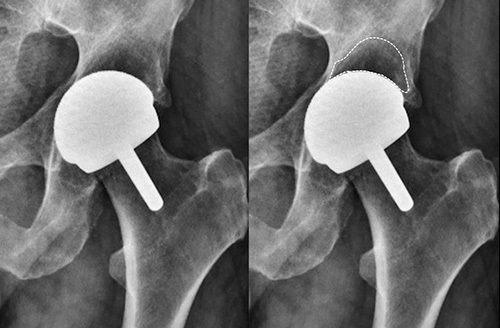 How does a Birmingham Hip Resurfacing compare to a THR? Clearly the BHR is much more bone conserving. The dislocation rate following hip resurfacing is much less than following THR. Clinical and laboratory studies also show that the function of a BHR is better than a THR. This is not a big issue for most patients who do not wish to become extremely active. What is a big issue however is that the death rate in the ten years following surgery is much higher with Total Hip Replacement compared to Hip Resurfacing. 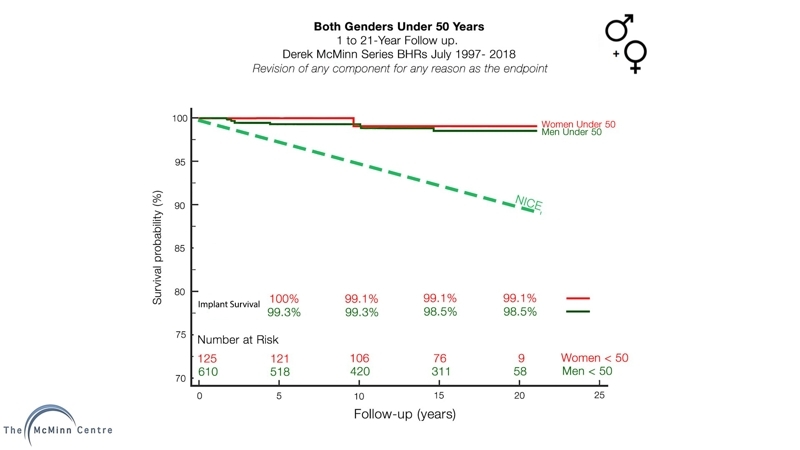 In the Birmingham mortality study we did not have available all the confounding factors that our statisticians wanted, however we published in the hope that others may be able to get those missing confounding factors. 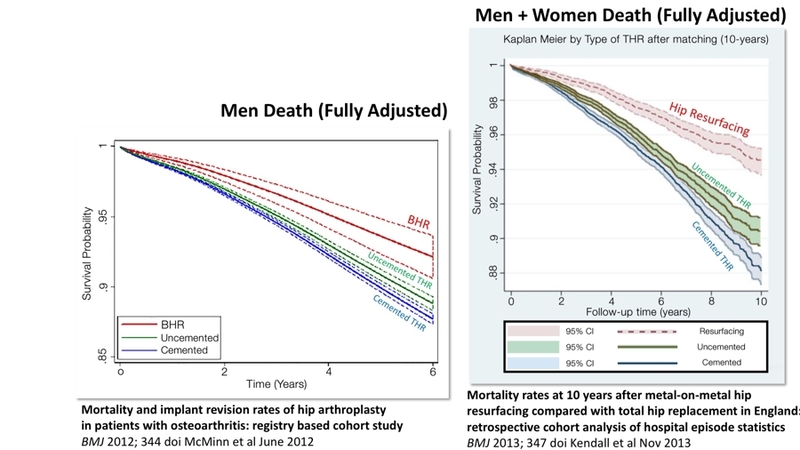 Kendall et al obtained every possible confounding factor and they have the best publication on death following different types of hip arthroplasty. This evidence is conclusive but most orthopaedic surgeons do not wish to acknowledge this publication as it would of course mean that this would have to be properly disclosed to patients prior to surgeons carrying out a Total Hip Replacement on those patients. Because of Charnley's success with polyethylene, hip resurfacing underwent a mini resurgence in the 1970's & 80's. Results were poor, with 50% failure at 5 years, but it demonstrated that death of the femoral head was not an inevitable consequence of resurfacing. Why were the results so different from total hip replacement? Laboratory simulator studies showed that the average size of the resurfacing head in men [50mm] wore the conventional polyethylene much more than that of Charnley's total hip replacement with a tiny head size. By the late '80s hip resurfacing was regarded by most surgeons worldwide as a failed concept. I was fortunate as a young surgeon to be working at the Royal Orthopaedic Hospital Birmingham, where a number of my predecessors had carried out large-head metal-on-metal total hip replacements over the previous 20 years. I made a point of following up those patients and the results were good. I was convinced that failures of the previous designs of resurfacing were not a failure of concept but a failure of materials and if the design of hip resurfacing included those metal-on-metal bearings, hip resurfacing could be turned into a successful procedure. I needed an engineer who could manufacture hip resurfacings, and was lucky to find one who had manufactured thousands of metal-on-metal THRs as a young man. The modern era of MoM hip resurfacing began with my first implantation in Feb 1991. Six years and several iterations later, the ideal design of implant had been established, the most effective instruments for inserting the implant had been developed and the optimum surgical technique for doing the procedure had gradually emerged. In developing the Birmingham Hip Resurfacing I was joined by my colleague, Mr Ronan Treacy and several engineers. The first BHR surgery was in July 1997 and that patient is functioning well 21.5 years later. By closely following up our patients, it became clear over the years that the BHR was a highly successful procedure and it proved to work very well in young active patients (Fig 4). Figure 4: Follow up results of BHRs in patients under 50 years at time of surgery. Over the last 21.5 years many surgeons have come to Birmingham to be trained in the techniques required to perform this surgery, and we have presented the results of the BHR all over the world. Over 150,000 BHR procedures have been performed worldwide. The next question that comes up is: what level of activities are these patients able to return to after their hip resurfacing? There are different ways of measuring the severity of activities after a hip replacement or a hip resurfacing. The most widely used measure was developed in Los Angeles and is called the University of California at Los Angeles (UCLA) Activity Level Scale. It has 10 levels, with level 1 being inactive, and levels 9 and 10 indicating participation in impact sports such as tennis, football, squash, badminton martial arts etc. Level 9 is occasional participation and level 10 is regular participation in impact sports. So why has hip resurfacing gone from around 10% of market share in several countries to 1% market share? Hip resurfacing is a much more difficult procedure for surgeons to perform than THR. MoM hip resurfacing demands precision surgery and component malposition can lead to high wear and so called pseudotumours (soft tissue masses and fluid collections). Surgeon error in component positioning is a major cause of failure. The second major cause of failure is poor implant design. This is typified by the ASR design which was nothing short of a disaster. Thankfully most of the BHR copycat designs have now gone. In the past MoM has also been used in THR and these have been totally abandoned now due to high failure rates. Metal on cross-linked polyethylene (MoX) bearings predominate now with the minority using ceramic on ceramic (CoC) bearings. The BHR bearing releases ions including cobalt, chromium and nickel into the blood stream. In well positioned BHR devices, obvious ill effects from cobalt and chromium are very rare. There may even be some advantages to cobalt being released into the bloodstream. A recent scandal in Australia identified that some horse trainers were injecting cobalt into the bloodstream of horses to make them run faster! (not a scrap of evidence to support this practice) However, nickel is a different matter and studies by the research team at The McMinn Centre demonstrate that BHR patients' immune system is affected, with some patients being rendered highly sensitive to nickel. Another problem is what is described as “stress shielding of the acetabular roof” following the BHR. The cobalt-chrome cup of the BHR, being made of metal, is rigid. It is over 200 times stiffer than the cancellous bone into which it is inserted (ceramic is even stiffer). This results in altered stress distribution through the bone above the socket and the roof of the socket can gradually melt away (Fig 5). Figure 5: 20 Years post BHR asymptomatic severe acetabular stress shielding; Area of acetabular roof bone disappearance marked. We have started to see this severe stress shielding in really long term follow up but to date it has not resulted in any failures. What we do know is that if a BHR cup needs revising then the missing acetabular roof bone is a problem for fixation of a new cup implant and surgeons need to know this and compensate for the missing bone at their revision procedure. What is the future for hip resurfacing? Professor McMinn says, "MoM bearings will eventually be abandoned in favour of more modern bearing materials." 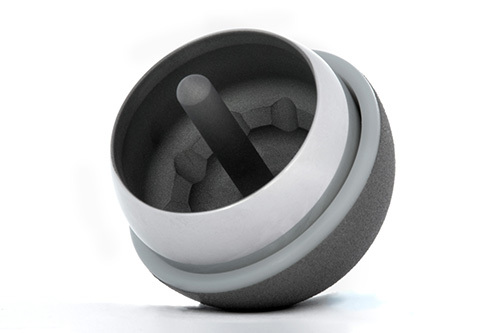 My colleague Professor Justin Cobb, at Imperial College London, is the leading proponent of ceramic on ceramic bearings for hip resurfacing and his design is currently in Clinical Investigation. What does all this mean for Sir Andy Murray and will he be able to return to competitive tennis? Orthopaedic surgeons like to base their advice and opinions on scientific evidence (apart from death issues!). Orthopaedic surgeons would like a large number of male singles Grand Slam tennis champions who have had a hip resurfacing and then returned to the Tour. However, not even one male singles Grand Slam tennis champion has returned to the Tour after a hip resurfacing so orthopaedic surgeons cannot provide a definitive answer. However, the average man or woman on the street armed with relevant information can give a clear answer. It is well known that patients with an arthritic hip have pain which gets worse with activity and can cause them sleepless nights. Sportspeople with an arthritic hip get fatigued and have great difficulty doing enough training between events, having to rest instead. Those of us who watched Sir Andy's fifth set in his match against Roberto Bautista Agut would say that he fatigued badly. They have some restriction of movement and if during a tennis match they move out of their relatively comfortable range of movement they often get a sharp jab of pain. It is well known that the BHR relieves pain, increases range of movement and allows normal patients and sportspeople to function normally. Sir Andy Murray will have had an arthritic hip for several years and we have all seen him limp on court. Indeed, Murray has become a Grand Slam champion despite the restrictions of an arthritic hip. How do you think Sir Andy will get on returning to tennis with a pain free hip, gradually becoming fatigue free and having little or no restrictions on his training time between events? The man or woman in the street would confidently say that he will obviously return to competitive tennis and the likelihood is he will be even better than before.